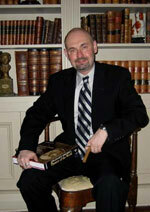 Robert W. Sullivan IV is a philosopher, historian, antiquarian, jurist, theologian, writer, and lawyer. The only child of antique dealers, he was born on October 30, 1971 in Baltimore, Maryland. He graduated high school from Friends School of Baltimore (the oldest private school in Baltimore, founded in 1784) in June 1990. He attended Gettysburg College in Pennsylvania becoming a brother of Lambda Chi Alpha (Theta Pi, member #1199) fraternity. He earned his B.A. in History in 1995. Mr. Sullivan spent his entire junior year of college (1992-1993) abroad at St. Catherine's College, Oxford University, England studying European history and philosophy. Mr. Sullivan is a Freemason, having joined Amicable-St. John's Lodge #25, Baltimore Maryland in 1997; he became a 32nd degree Scottish Rite Mason in 1999, Valley of Baltimore, Orient of Maryland. The Royal Arch of Enoch: The Impact of Masonic Ritual, Philosophy, and Symbolism is his first published work and is the result of twenty years of research. A lifelong Marylander, he resides in Baltimore.